Numerous new discoveries made during the regional exploration program surrounding the past-producing Monique Mine, five kilometres east of the New Beliveau Resource. Near surface discovery grading 24.8 g/t Au over 2.2 metres within a larger zone of 5.9 g/t over 10.5 metres, located 400 metres northwest of the Former Monique Open Pit. Winter drilling program planned to follow-up on new zones. Montreal, Quebec, Canada, October 23, 2018 – MONARQUES GOLD CORPORATION (“Monarques” or the “Corporation”) (TSXV: MQR) (OTCMKTS: MRQRF) (FRANKFURT: MR7) is pleased to provide new results from Probe Metals Inc. (“Probe”) 2018 drill program on the Monique property (the “Property”) located near Val-d’Or, Quebec. Probe may earn a 60% interest in the Property by spending an aggregate of $2 million on exploration before January 2021. 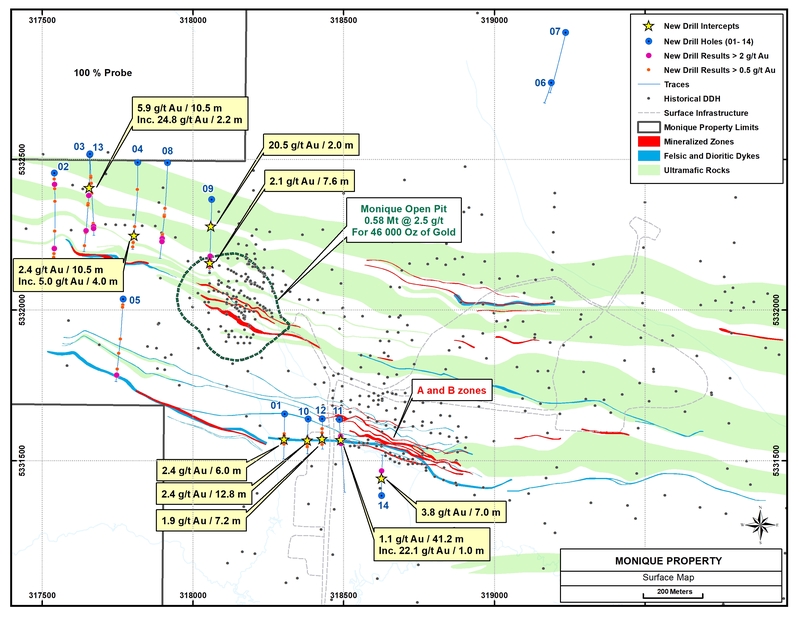 Results from 14 drill holes, totaling 4,783 metres, were received and showed significant new discoveries northwest of the Former Monique open-pit gold mine and southwest of the A and B gold zones (see figure 1). Probe is now preparing for the 2019 winter drill program to follow up on the recent discoveries. Significant drill results are presented below. Of the fourteen holes, seven were designed to test a large under-explored area North, West and northwest of the Former Monique Open Pit along the mineralized trend. 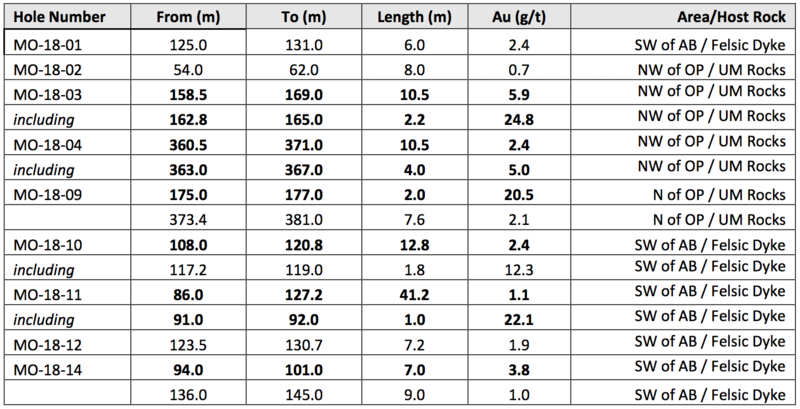 Best assay results were from hole MO-18-03 at 159 metres depth (down hole), which returned 24.8 g/t Au over 2.2 metres in a larger interval grading 5.9 g/t Au over 10.5 metres. This hole is located 400 metres northwest of the Monique pit and proximal to our 100%-owned property. Hole MO-18-09 was drilled 200 metres North of the Monique pit and also returned encouraging results with two gold zones intersected at 175 and 373 metres depth (down hole) grading respectively 20.5 g/t Au over 2.0 metres and 2.1 g/t Au over 7.6 metres. The deepest intercept corresponds to the extension of the in-pit gold mineralization 50 metres to the North and the other intercept is possibly the lateral extension of the new gold structure intersected in hole MO-18-03. Five holes were drilled to test a weak IP anomaly located 50 to 200 metres southwest of the historic A and B gold zones, with all returning significant results between the surface and 130 metres depth. Gold mineralization is associated mainly with felsic dykes cross-cutting mafic volcanics. Holes MO-10-14, 11 and 10 returned the best intercepts grading respectively: 3.8 g/t Au over 7.0 metres, 1.1 g/t Au over 41.2 metres and 2.4 g/t Au over 12.8 metres. The remaining two holes were drilled 1 kilometre northeast of the Monique pit and tested a lone IP anomaly. Neither hole returned significant gold values. Mineralization intersected along the Monique Gold Trend is characterized mainly by sulphide-bearing quartz-carbonate-tourmaline veins and veinlets in mafic to ultramafic rocks or associated with mineralized dioritic or felsic dykes. Gold is generally associated with 1% to 5% finely disseminated pyrite, and visible gold is common. Rock units are generally altered with variable amounts of chlorite, carbonate, sericite and/or silica. Albite and fuschite alteration are locally observed. The orientation of the quartz vein systems is roughly parallel to the stratigraphy and to the deformation zones. The Monique property is located 25 km east of Val-d’Or, in Quebec, and consists of 17 claims and one mining lease covering a total area of 546 hectares in the Louvicourt township. The property hosts a current inferred mineral resource of 107,500 tonnes at a grade of 4.88 g/t for 16,850 ounces of gold. From 2013 to 2015, the Monique open pit mine was in operation and a total of 0.58 Mt of ore was extracted at a grade of 2.5 g/t Au, from the surface to 100 metres depth for a total of 45,694 ounces of gold. Gold mineralization on the Monique property has been identified in 12 zones, which are generally hosted by one of three deformation zones that cross the property from east to west. Gold mineralization is defined by a network of quartz/tourmaline/carbonate veins and veinlets, with associated disseminated sulphides, in the altered wall rocks. Gold is frequently observed in the quartz-tourmaline veins. The scientific and technical content of this press release has been reviewed, prepared and approved by Mr. Marco Gagnon, P.Geo, Executive Vice President of Probe, who is a "Qualified Person" as defined by National Instrument 43-101 - Standards of Disclosure for Mineral Projects.